An unfortunate church dinner more than 100 years ago did more than just spread typhoid fever to scores of Californians. It led theorists on a quest to understand why many diseases - including typhoid, measles, polio, malaria, even cancer - take so much longer to develop in some affected people than in others. It's been known for more than 60 years that the incubation periods of numerous diseases follow a certain pattern: relatively quick appearance of symptoms in most cases, but longer - sometimes much longer - periods for others. It's known as Sartwell's law, named for Philip E. Sartwell, the epidemiologist who identified it in the 1950s, but why it holds true has never been explained. "For some reason, [biologists don't] see it as a mystery," said Steve Strogatz, the Jacob Gould Schurman Professor of Applied Mathematics. "They just see it as a fact. But we see it as, 'Why? Why does this keep coming up?'" 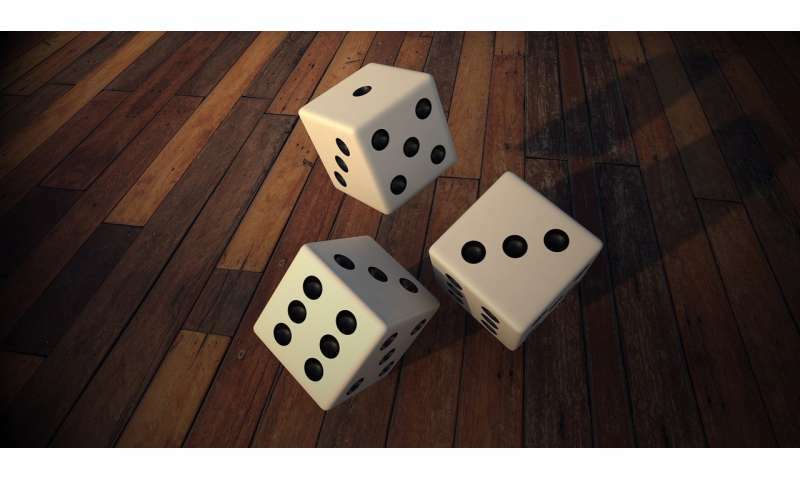 Through mathematical modeling and application of two classic problems in probability theory - the "coupon collector" and the "random walk" - Strogatz and doctoral student Bertrand Ottino-Löffler propose an explanation. Working with a simple mathematical model in which chance plays a key role, they calculated how long it would take a bacterial infection or cancer cell to take over a network of healthy cells. The distribution of incubation times in most cases, they contend, is close to "lognormal" - meaning that the logarithms of the incubation periods, rather than the incubation periods themselves, are normally distributed. This emerges from the random dynamics of the incubation process itself, as a pathogen or mutant competes with the cells of its host. Their paper, "Evolutionary Dynamics of Incubation Periods," was published Dec. 21 in eLife. Contributing biomedical background was Jacob Scott, physician-scientist in the Department of Translational Hematology and Oncology Research at the Cleveland Clinic. Reading Scott's blog, Cancer Connector, motivated Strogatz and Ottino-Löffler to study disease incubation dynamics. "I saw a post about using evolution on networks to analyze cancer, which seemed interesting because cancer is very much an evolutionary disease," Strogatz said. "People including Jake have been looking at cancer from this evolutionary perspective." The discovery that incubation periods tend to follow right-skewed distributions - with symptoms quickly developing for most people, with much longer periods for a few, so that the bell curve has a long "tail" to the right - originally came from 20th-century epidemiological investigations of incidents in which many people were exposed to a pathogen. For example, at the 1914 church dinner in Hanford, California, 93 individuals became infected with typhoid fever after eating contaminated spaghetti. Using the known time of exposure and onset of symptoms for the 93 cases, California medical examiner Wilbur Sawyer found that the incubation periods ranged from three to 29 days, with a mode (most common time frame) of only six days. Most people were sickened within a week of exposure, but for some, it took four weeks to get sick. As it turns out, nearly all diseases - and as Strogatz and Ottino-Löffler contend, most situations where "good" is overtaken by "evil" - follow this pattern of quick proliferation for the majority, with a few "victims" lasting longer before finally succumbing. The different levels of health and of exposure to the pathogen can certainly play a role, Strogatz said, but are not the determining factors. Strogatz's proposal follows the "coupon collector" theory: Imagine someone collecting baseball cards or stamps in a series. If a random item arrives every day, and your luck is bad, you may have to wait a long time to collect those last few. Strogatz admits that while it's tricky to generalize too broadly, this theory holds up following countless simulations and analytical calculations performed by Ottino-Löffler. And this could be helpful in explaining not only disease proliferation, but also other examples of "contagion" - including computer viruses and bank failures, the researchers say. "In a very stripped down, simplified picture of reality, you'd expect to see this right-skewed mechanism in many situations," Strogatz said. "And it seems that you do - it's sort of a basic vocabulary of invasion. It's a powerful underlying current that's always there." "The different levels of health and of exposure to the pathogen can certainly play a role, Strogatz said, but are not the determining factors." Yeah, trying to pin down the ephemeral variations of constantly evolving biology? Is kinda like trying to nail blobs of jello to the wall. No cooperation! And lots of frustration. With a wildly swinging hammer in play? Someone is gonna get hurt. Possibly and most probably your own thumb!